Glenn Lindgren: Tasajo is a dish that is not very familiar to most Anglos. You can find tasajo in the refrigerator case at many Latin American markets. Raúl Musibay: Tasajo is dried beef that's been reconstituted with water and spiked with sour orange juice to give it a nice citrus bite. 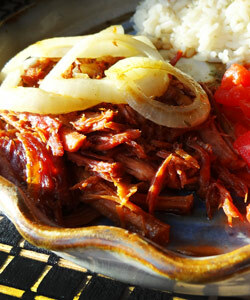 Jorge Castillo: Many people eat tasajo with a criollo sauce of tomatoes, green peppers, and onions. Raúl likes his tasajo served over white rice. Raúl Musibay: Hey man! Once you try tasajo, you'll love it. It's great! Dried beef, fried until crispy and spiked with sour orange juice to give it a nice citrus bite. Soak dried beef overnight. Boil the jerked beef for an hour to desalt it, change the water and boil it again until soft enough to separate into strands. Drain. Cut meat in pieces and pound with meat hammer. Season with sour orange juice. Sauté garlic, onion and oregano in oil until onions are cooked through. Add beef pieces and sauté until meat is browned with crispy edges. Variation: Make a criollo sauce by frying green pepper, onion, and garlic in olive oil until limp. Add fresh chopped tomatoes and some tomato sauce, cook on low heat for about 15 minutes. Serve as a sauce or mix into the prepared tasajo.